Has it really been less than two weeks since I last blogged? It feel like a lot longer! I'd just like to update you on everything that's happening since I'm still getting lots of lovely comments and tweets asking how the new job is going. It's actually going really well. The past week few weeks have been training, and the doors open to the public tomorrow - which is very exciting, but also nerve wracking. But it's nice that everybody is in the same boat. It looks like I'll be working a lot of hours, and I said to my new boss that's good as I like having lots of money for clothes. "Oh good," He replied. "Then you'll be able to afford a decent outfit for once!" Another great thing is that everyone seems really nice. It helped that we all had drinks after three days, so everyone got laughing and chatting. However it means that I'm having to give up co-presenting my radio show with Daniel, as I'll be working most weekends. Today was my last show for the near future, and as I've been living in jeans and t-shirts all week I dressed up a little. It was also a lovely day, and I've been looking for an opportunity to wear this gorgeous shrug from Primark (their stuff is SO good at the minute - I need to start going there more!). I originally planned to wear it with a plain black dress to make the print pop, but as I was feeling quite summery I wore it with my favourite dress from Domino Dollhouse. I've never really experimented with clashing prints before, and you know what? POINT OF FASHION: Clashing prints. I also recently bought a new pair of brogues from Primark. They have a heel on them, which is a welcome change when I live in flats. Which I love, but does anyone else get sore feet after a while? 1: Afformention drinks at work. 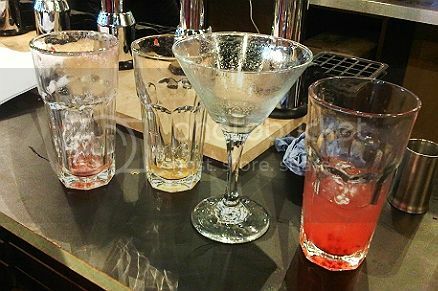 The bar next door is serving cocktails, and as I may have a few shifts in there we learnt how to make them properly by a mixologist. Yummm. 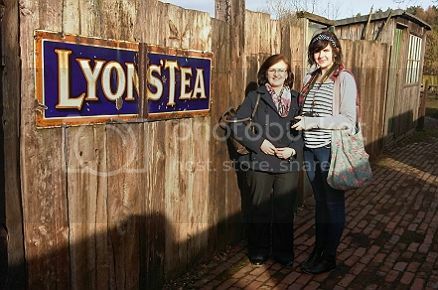 2: We had a family date to Beamish last weekend. We're never usually one of those "OMG IT'S THE WEEKEND, LET'S DO A FAMILY ACTIVITY!" kind of family, so it was a nice change. 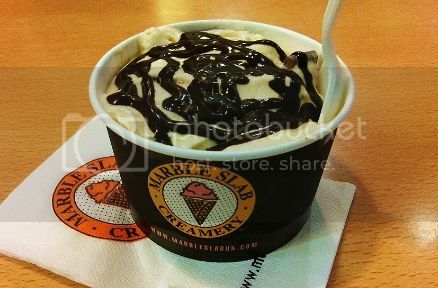 3: I broke my Lent pledge to give up chocolate yesterday at Marble Slab. Meh, if I'm going to cheat I might as well do it properly. Anyhoo, I just wanted to update you all on how I've been. I can't promise to blog as much as I usually do at the moment, but I've really missed you all! I'm still doing my 365 Tumblr, and tweeting as much as I can. Also, I'll try my best to answer your questions from the Q&A post sometime this week! So if you have any other questions, please just leave a comment. PS: OH, and before I forget, this week's excitement is also brought to you by The Vines! My all-time favourite band are releasing their new single Gimme Love tomorrow (although you can stream it for free here), have a new album in June, and released this promo for the music video a few days ago. Epic fangirling happened, I tell thee. I can't believe the original members are in their thirties now! I love your shoes. And BEAMISH! I visited there when I was younger and I always have a soft spot for it - I love historical recreation villages. 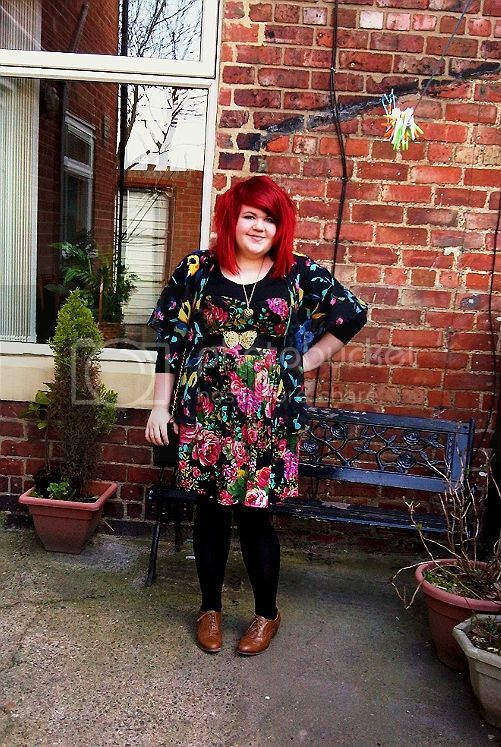 I am ALL for clashing prints and breaking Lent! Yay! :O me like-a the clashing! It's fabulous, especially with your hair, though I seem to remember you saying that might not last much longer?! Oh no, now I've seen that ice cream I want to go and delve into the Ben and Jerrys in my freezer... but it's 10 to 1, and I need to go to bed! I bought some brogues from Office recently and they've got a little tiny heel, more of a block than a proper heel to be exact, and they're absolutely perfect. I've got short tendons in my ankles and completely flat shoes make my calves ache,but these are just right- not too high, not too low! I'm so chuffed with them! Nice clashing :D I've been quite surprised with Primark clothing. They're great compared to the price - which is CHEAP. Brilliant outfit. I've been experimenting with clashing colours and prints recently but haven't quite managed to pull it off. This looks amazing! Glad to hear the job is going well and I hope its continues that way. You deserve it! just found your blog and im thoroughly enjoying it miss! Love that Primark cardigan....I'm planning a trip there at the weekend and I actually can't wait. Well done on the new job....I start one in a few weeks too! Glad to hear your new job is going well! I love that dress. It is so pretty! We saw the Vines years ago and they were awesome. Supper Duppper Cute! Hey Girl, I'm a new follower and I love your style. You really have a fun edgy sassiness that I enjoy. So happy I found you!